The Pantone Formula Guide is used for selecting, specifying and matching solid Pantone colours and feature an impressive 1,867 colours. The Guide comes in two formats, printed on coated or uncoated stock, but you can also purchase both guides in a money saving two book set. 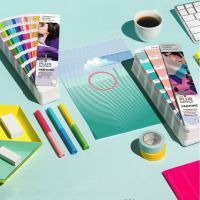 Each page of the guide contains seven areas of solid Pantone colour and for each colour the guides displays it's unique Pantone number, and the Ink formulations to aid in ink mixing. See the guides full product details and an informative video.